His mind would go blank during exams. Sometimes the anxiety made him shake. He didn’t enjoy speaking before others. At one point, he considered taking his own life. That was Will Miller. Anxiety in check. Depression under control. Graduate of Tidewater Community College with plans to become a teacher and a lot more skilled in ballroom dancing than he ever dreamed. 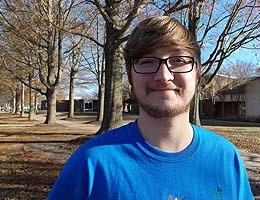 That is Will Miller, who will walk across the stage at Old Dominion University’s Ted Constant Convocation Center on Dec. 20 to receive his associate of science degree. He plans to transfer to Old Dominion for the fall semester to pursue a career as an elementary schoolteacher. “I have a lot of people from TCC to thank,” said Miller, whose confidence soared in part because of what he learned from two faculty members at the college: history professor David Neff and ballroom dancing instructor Erika Phillips. Miller enrolled in TCC in 2007 after graduating from Friends School in Virginia Beach. He didn’t have a direction and dabbled in classes in search of a career path. One of his roadblocks was anxiety, including the same test anxiety that hindered him in high school. Neff was a help, sharing techniques that included reading the material aloud as if the test was being given verbally. Miller disliked speaking in front of large groups. While his public speaking class helped, he gained more confidence when he signed up for Phillips’ ballroom dancing class as his physical education elective. At his lowest point, Miller felt his world crumbling and couldn’t shake the belief that he was disappointing others. He was plagued by suicidal thoughts. Encouragement from his mother – who graduated from TCC a year ago with an associate of science – pulled him through the trying period. “If it wasn’t for her, I wouldn’t have been able to overcome it,” he said. Neff and Phillips were confidants, too. Miller said the birth of his first niece, Amelia, last November, “a ray of sunshine,” also helped him refocus. Miller relishes the idea of sharing what he learned at TCC with others. He discovered his affinity for teaching after giving presentations in history classes, and he believes he has the tools – patience, energy and enthusiasm – to mentor younger children.